"Seeking Alpha": Oil Price Plunge Should Have Tar Sands, Shale Oil Investors "Very Very Nervous"
If you are interested in electricity demand response, this New York Times article highlights something you definitely want to keep an eye on. The gist of it is that an ongoing legal fight is pitting "companies that own power plants" against "companies that recruit consumers to unplug themselves when electricity use is high, in exchange for a price break." What happened is that in 2011, "the Electric Power Supply Association sued the [Federal Energy Regulatory Commission - FERC], saying that demand response should be regulated by the states, not the federal government because the transactions are retail, not wholesale." The deeper concern by the power companies is that demand response reduces "peak prices on their busiest, most profitable days," and "the producers say, they need that income to survive." This past May, "the United States Circuit Court of Appeals in Washington sided with the association." As we know, the billionaire Koch brothers and their fossil fuel allies have been waging relentless war against clean energy for years now. Yet, as this fascinating article in National Journal explains, while the Koch-funded group Americans for Prosperity (AFP) has seen some successes at the national level in fighting clean energy, they are larging striking out in the states. Why is this the case? A few key points from the National Journal article answer that question. A new survey from George Mason University's Center for Climate Change Communication and Yale's Project on Climate Change Communication has some encouraging results about U.S. public opinion on climate change and clean energy. 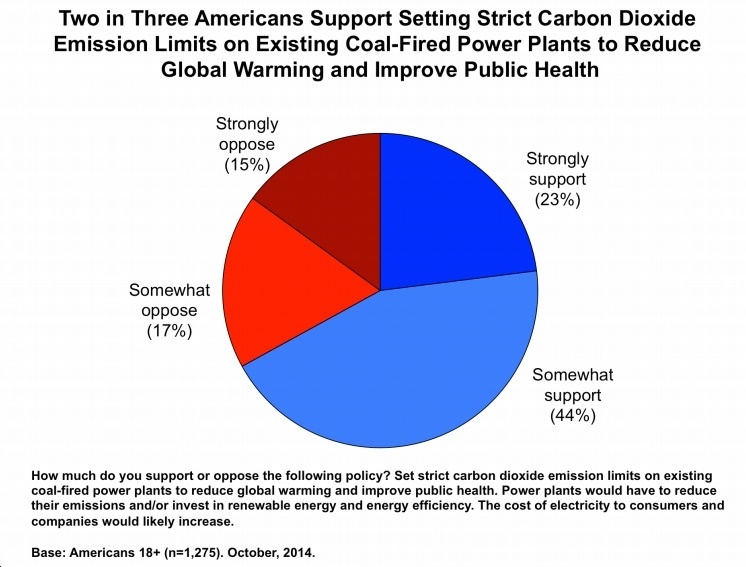 Here are three graphs we thought were well worth sharing The key points are: 1) 67% of Americans support what is, essentially, the EPA's proposed Clean Power Plan to limit carbon pollution from existing, coal-fired power plants; 2) Americans overwhelmingly support policies - like Renewable Portfolio Standards, R&D, tax rebates - to promote clean energy; and 3) only 16% of Americans actively refuse to believe the science on climate change. Now, we just need policymakers to translate the wishes of the American people into action. Clearly, fossil fuel forces will go to great lengths to denigrate renewable energy. For instance, we've seen them hype false "scandals," like Solyndra, which turned out to be untrue on every level. We've also heard their repeated refrains about how clean energy supposedly requires heavy subsidies (in fact, fossil fuels receive many times the subsidies that clean energy get) to be competitive with fossil fuels, even as the costs of solar and wind plummet, to the point where they're now cheaper than new coal or nuclear power plants. Here are five recommended reads for today (11/11/14). I received the following press release earlier today and thought it was well worth passing along. On a related note, I just finished reading Virginia Climate Fever, which makes abundantly clear what's at stake for Virginia - and other states - if we don't take strong action quickly to transition from carbon-based energy to solar, wind, efficiency, etc. An op-ed in yesterday's Virginian-Pilot is a must-read for anyone who cares not just about Virginia's energy and economic future, but really about any state in the country. The following are a few key points by Virginia Advanced Energy Industries Coalition (VAEIC) President Francis Hodsoll regarding the Virginia State Corporation Commission (SCC)'s recent "analysis" (using the word loosely) of the EPA's Clean Power Plan. 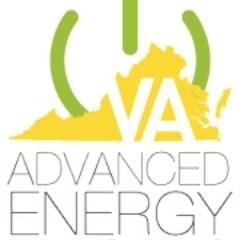 Note that the mission of VAEIC is to "[promote] open markets for clean and secure advanced energy technologies in order to create jobs and position Virginia as a magnet for talent and innovation in the advanced energy sector." 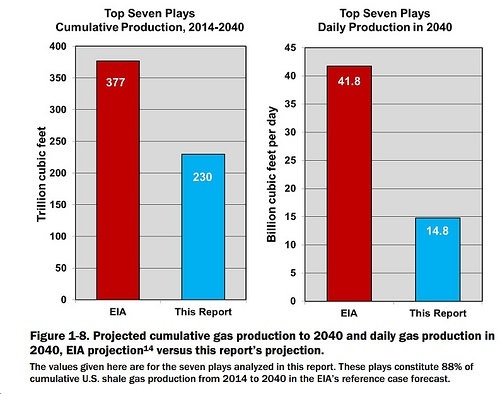 Post Carbon Institute: U.S. Oil, Gas Fracking Boom "unsustainable;" EIA Forecasts "extremely optimistic"
According to the U.S. government's latest long-term forecast, the country can expect a "56% increase in total natural gas production from 2012 to 2040," with shale gas production "the largest contributor, growing by more than 10 Tcf" through 2040; and with "tight gas" production also growing sharply over that time period. The other day, the New York Times broke a fascinating story of a secretly-taped speech by Richard Berman (we've included the audio, edited to include video, images, etc). Berman is a consultant who has, among other things, worked to "undermine his opponents, like labor unions or animal rights groups that have tried to spotlight the treatment of animals at meatpacking plants" - to the Western Energy Alliance, a "Colorado-based oil and gas drilling trade and lobbying group funded by 400 independent natural gas and oil producers, service and supply companies, banking and financial institutions and industry consultants." Here's an excerpt from the New York Times story, followed by a few lessons the clean energy industry might gather from this.